- Publisher Why should churches heal? Does your church touch the lives of broken people and bring healing to their hearts? How does a church become that healing force that glorifies God and impacts whole communities? In a desperately hurting world full of toxic relationships, crippled values, and mutilated morality, lives are crying out for real healing -- not drug-induced solutions, not psychobabble Band-Aids, but authentic answers that heal the heart, soul, mind, and strength. There is only one source for such healing power. The Church that was built on the One who said to the world, "Come to me all you who are weary and burdened." The question is not can we become a church that heals shattered lives but will we. Doug Murren, in this insightful, inspiring, and instructive book, reveals why and how you can become a healing force in your neighborhood, community, and the world. 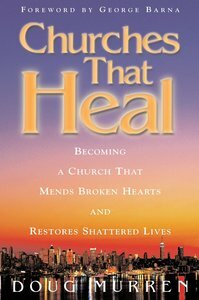 Why should churches heal? Does your church touch the lives of broken people and bring healing to their hearts? How does a church become that healing force that glorifies God and impacts whole communities? In a desperately hurting world full of toxic relationships, crippled values, and mutilated morality, lives are crying out for real healing -- not drug-induced solutions, not psychobabble Band-Aids, but authentic answers that heal the heart, soul, mind, and strength. There is only one source for such healing power. The Church that was built on the One who said to the world, "Come to me all you who are weary and burdened." The question is not can we become a church that heals shattered lives but will we. Doug Murren, in this insightful, inspiring, and instructive book, reveals why and how you can become a healing force in your neighborhood, community, and the world. Doug Murren is the director of Square One Ministries, a ministry dedicated to consulting and helping outreach evangelism-focused churches minister in this post-Christian era. He has written nine books, including: Churches That Heal (with George Barna), Achieving Your Dreams: The Joseph Factor, and Leader Shift.